The international summer Workshop was generated to offer room for creation and exchange, furthermore the target is to intensify the growth of the collective PASSIONRED. 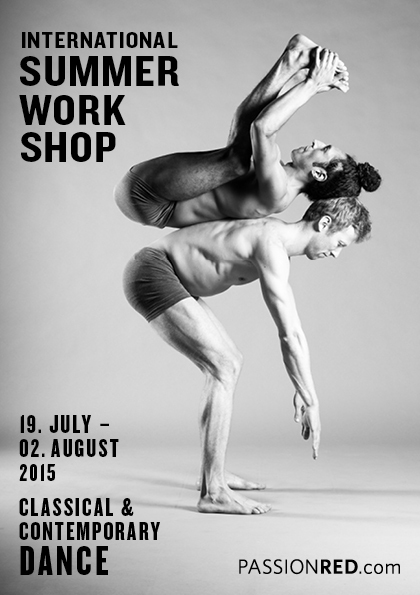 It is a two-week intensive Workshop for advanced, pre-professional and professional dancers. The focus is on partnering and contact dance, technical training, rehearsing choreographies and dance-pieces of PASSIONRED, as well as on the development of personal and collective work. The Workshop comprises a intensive training for classical and contemporary dance as well as the technics of a full body training with Gyrokinesis, Pilates, streching and floor bar. Professional dancers from all over the world share with you their knowledge and offer individual mentoring and support. Our intention is to engage with a variety of artists, to explore and share in a choreographic and research environment. Furthermore PASSIONRED is holding the summer workshops with the idea of future collaboration with some of the dancers. 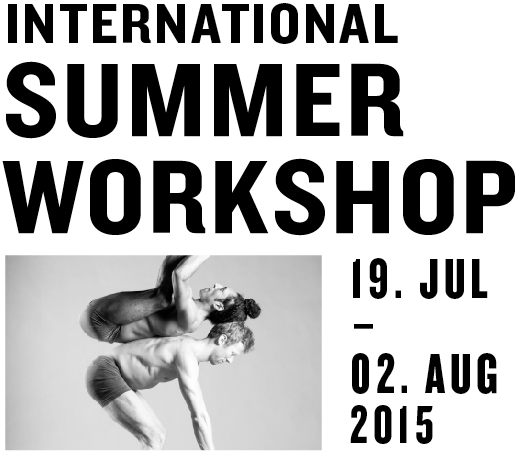 For the summer residency workshop we select 10 suitable dancers. This opens the possibility to concentrate on the development of every person. During this two weeks you are going to work very intensive, meet new people and gain experience. In the same time you also have the chance to get to know beautiful parts of Austria. For the year 2015 PASSIONRED collective is going to create a new piece called „Cuerpo Fundido“ (melting bodies). The concept of the piece will be fundamental for the research during the Summer Workshop. Your mentor and teacher for the International Summer Workshop 2015 will be Julian Ricardo Yopasá Samacá – Dancer, Choreographer and Founder of the PASSIONRED collective. He will create with you the choreography for the final Performance, give you personal advice and share as much experience as possible. Selina Glockner, a German dancer and participant of last years Summer Workshop, is going to assist Julian in the classes. Together they will introduce you to the choreography and partner work of our upcoming project „Cuerpo Fundido“ as well as to our current Project „TOYBOX“ which will be presented in Sao Paulo on 6. of december 2014. Furthermore we invite Ewa Wilisowska – Polish dancer and certified Gyrokinesis trainer – as a guest teacher for the morning classes. The dance-studio and your rooms are in the middl of an old farm in the lake-area of Austria. For the time of your visit you can spend your freetime in a traditional timber house with garden. The house has a kitchen, toilet, balcony and a big dining and meeting room for the whole group as well as a terrace with tables. The buffet for Lunch and Dinner will be served there as well. Your neighbors are going to be some deers, which are living behind the timber house in a fenced area. Next to the timber house you cross a small river and find the dance studio with shower, as well as the farm of the family Hochreiter. You will sleep in the guest-rooms of the farm/apartment with shared bathroom. You arrive on 19. July, preferably in the morning or early afternoon, so that we still have time to show you the surrounding and get to know each other at the welcome-BBQ. The Workshop starts on 20. of July. After 19:00 o´clock you are free to use the Studio on your own. Saturday and Sunday (25. and 26. of July) are your free days. You can take part in the group-trips that we plan or do whatever you feel like. On Satureday 1. Aug. and Sunday 2. of August you are going to present the choreographies and pieces in a performance. On Sunday evening will be a goodbye-dinner and on 3. of August is departure. When you arrive, you find a unique, quiet and inspiring atmosphere, surrounded of nature. In your freetime you can explore the area and do trips with us – have a relaxed day at one of the lakes like Attersee or Wolfgangsee, go for a trip with the tractor to the forest, visit the waterfalls at Traun or get to know the city Salzburg. We offer you breakfast lunch and dinner, if you are still hungry after that you can take from the fridge whatever you like. (excluding Restaurant visits or extra costs for trips) Please inform us in advance if you prefer to eat vegetarian meals or need any special diet (exp. lactose intolerance, allergies) We will do our best, to take care of your needs. Towels and linen will be provided.